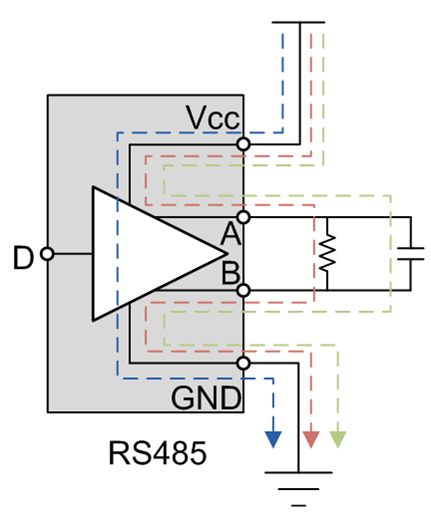 In need of a refresher on RS-485 transceiver design? This blog post features insights based on frequently asked questions within the TI E2E™ Community and is a helpful resource for anyone looking to learn more about this established communications standard. 1. When do you need termination on your RS-485 bus, and how do you terminate properly? RS-485 bus termination is useful in many applications, as this implementation helps improve signal integrity and reduces communication issues. “Termination” means to match the characteristic impedance of the cabling to the termination network, enabling the receiver at the end of the bus to see the maximum signal power. An unterminated or improperly terminated bus will introduce a mismatch, creating reflections at the end of the network, which can degrade overall signal integrity. In situations where the two-way loop time of the network is much greater than the signal bit time, termination is not necessary, as the reflections will lose energy each time they reach the end of the network. But for applications where the bit time is not substantially longer than the cable loop time, termination is crucial in order to minimize reflections. 2. What is fail-safe biasing, and how do you implement it? Fail-safe biasing is a way for you to ensure that your RS-485 receivers do not fall in an indeterminate state for differential input voltages. The Electronic Industries Alliance (EIA)-485 standard states that the input thresholds of an RS-485 are logic high for differential voltages ≥+200mV and logic low for differential voltages ≤-200mV, which leaves a 400-mV indeterminate state between the high and low thresholds. Select transceivers that have built-in fail-safe input thresholds in the receiver. Add external resistors to create an external bias on the idle bus. Both methods will ensure a logic-high state on the bus. Read the blog post, “RS-485 basics: two ways to fail-safe bias your network. 3. How do you calculate the maximum number of nodes on an RS-485 bus? RS-485 is a multipoint differential bus, meaning that all of the nodes on the bus share one common transmission medium. As the total number of nodes increases, the loading on each driver will increase as well. The Telecommunications Industry Association (TIA)/EIA-485 standard created a hypothetical unit load (UL) to help calculate the maximum number of nodes on a RS-485 bus. The standard states that a driver must be able to drive at least a 1.5-V differential signal across a maximum of 32 unit loads in parallel with two 120-Ω termination resistances at opposite ends of the bus. 4. How do you know when you need to add a ground wire between nodes? When designing a remote data link, you must assume that some ground potential differences exist. These voltages add common-mode noise, Vn, to the transmitter output. Even if the total superimposed signal is within the receiver’s input common-mode range, relying on the local earth ground as a reliable path for the return current is unsafe. When the ground potential difference (GPD) exceeds the common-mode range of the receiver (a frequent occurrence with longer cables and high current loads), you will need to use proper grounding techniques. Figure 2a shows remote nodes that are likely to draw their power from different sections of an electrical installation. Any modification to the installation, such as during maintenance work, can increase the GPDs to the extent that the receiver’s input common-mode range is exceeded. Thus, a data link working today might stop operating in the future. The direct connection of remote grounds through ground wire is also not recommended (Figure 2b), as direct connection causes large ground loop currents to couple into the data lines as common-mode noise. To enable direct connection of remote grounds, the RS-485 standard recommends the separation of device ground and local system ground via the insertion of resistors (Figure 2c). Although this approach reduces the loop current, the existence of a large ground loop keeps the data link sensitive to noise generated somewhere else along the loop. Thus, a robust data link has not yet been established. The best approach to tolerate GPDs up to several kilovolts across a robust RS-485 data link and over long distances is to galvanically isolate the signal and supply lines of the bus transceiver from its local signal and supply sources. In this case, supply isolators (such as isolated DC/DC converters) and signal isolators (such as digital capacitive isolators) prevent current flow between remote system grounds and avoid the creation of current loops. 5. What’s the length vs. speed recommendation for RS-485? The maximum bus length is limited by the transmission line losses and the signal jitter at a given data rate. Because data reliability sharply decreases for jitter of 10% or more of the baud period, Figure 3 shows the cable length vs. data-rate characteristic of a conventional RS-485 cable for a 10% signal jitter. On Figure 3, the circle labeled No. 1 represents the area of high data rates over a short cable length. Here, you can neglect the losses of the transmission line; the data rate is mainly determined by the driver’s rise time. Although the standard recommends 10 Mbps, today’s fast interface circuits can operate at data rates as high as 50 Mbps. The red No. 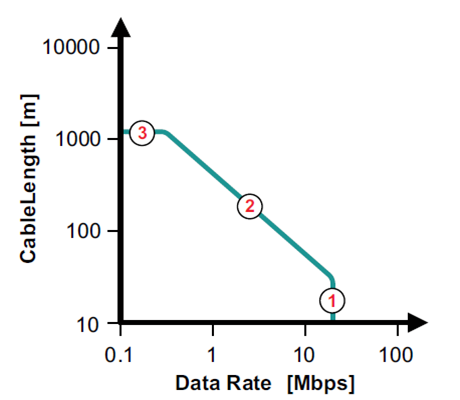 2 on Figure 3 represents the transition from short to long data lines. You have to take into account the losses of the longer transmission lines. Thus, with increasing cable length, the data rate must be reduced. A rule of thumb states that the product of the line length [m] times the data rate [bps] should be 107. The red No. 3 represents the lower-frequency range, where the interaction between the cable series resistance and the end-of-line termination results in attenuation of the signal. At a certain point, the amplitude of the signal becomes smaller than what the receiver can properly detect (that is, it does not exceed the VIT threshold). 6. How do you estimate the power dissipation of RS-485? To calculate the power dissipation, you can divide the power into several parts. When the device powers on with no external load, the power consumption is used for the integrated circuit itself. If you add loads at the output pins, the power of driving the load will be drawn from the device. Since RS-485 has differential signaling, the load is usually added between the A and B pins. In Figure 4, the blue trace, PDic, is the power the device consumes. For low data rates, the power dissipation mostly comes from the resistive load (the red trace), PDdc. For high data rates, the power dissipation from the capacitive load needs to be accounted for (the green trace), PDac. If you put a resistive load on the bus, the driver generates a voltage (Vod) on it, as illustrated in Equations 5 and 6, where C is the parasitic capacitance, which includes the capacitance of the transceiver, the capacitance of the load and the trace capacitance. The data frequency, f, is also included in the calculation. 7. How do you protect your RS-485 interface from electrostatic discharge (ESD)? There are several types of ESD protection, including human body model, International Electrotechnical Commission (IEC) contact discharge and IEC air-gap discharge. If a transceiver has integrated IEC ESD (such as TI’s THVD1450 or THVD1500), then it requires no external components to protect the RS-485 interface from ESD at the level at which the transceiver is specified. 8. How do you know if you need an external TVS diode? Industrial networks must operate reliably in harsh environments. Electrical overstress transients caused by ESD, the switching of inductive loads or a lightning strike will corrupt data transmission and damage bus transceivers – unless you take effective measures to diminish transient impact. The ESD immunity test, IEC 61000-4-2, simulates the electrostatic discharge of an operator directly onto an adjacent electronic component. The THVD1500 and THVD1450 were tested to this standard. The electrical fast transient (EFT) or burst immunity test, IEC 61000-4-4, simulates the everyday switching transients caused by the interruption of inductive loads, relay contact bounce, etc. The THVD1450 and THVD1550 were tested to this standard. Surge immunity test IEC 61000-4-5, the most severe transient immunity test in terms of current and duration, is approximately 1,000 times longer than the ESD and EFT tests. The THVD1429 and THVD1419 were tested to this standard. TI’s latest RS-485 transceivers from the THVD family integrate various levels of protection according to these standards and do not require additional external protection. The levels of protection are specified in the device’s data sheet. Anything we missed? Let us know in the comments, and we will send feedback to help you overcome your RS-485 design challenges.